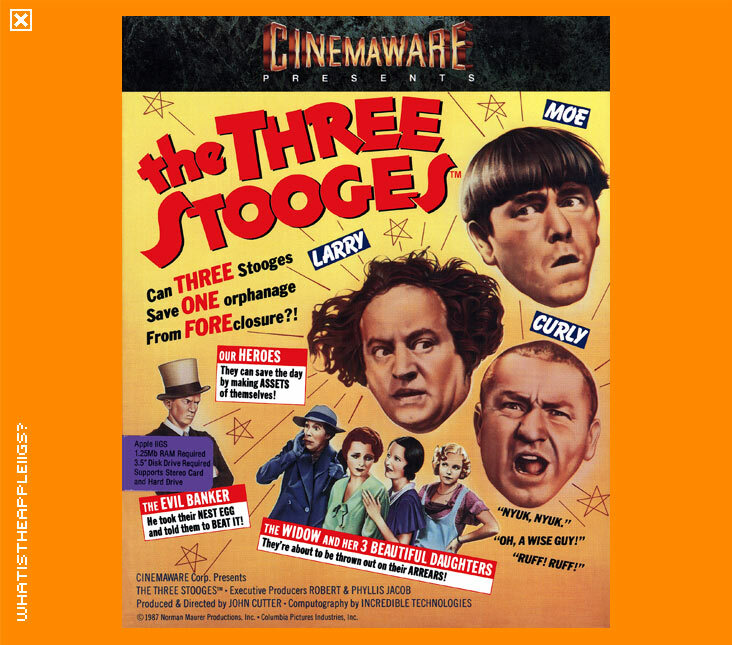 The Three Stooges computer game allows you to play the madness the Stooges portrayed on those non-computer screens. Sounds cheesy, but this is a Cinemaware game - beautifully created graphics, brilliant sound effects, involving game play and fantastic music score; another excellent game from Cinemaware. God bless em. Being the wonderful philanthropists that they are, The Three Stooges decide to raise money for the local orphanage to prevent it from closure by the morally revoked bank manager. You start each day with a choice of what to do to fill it. However, this choice is only made if you're quick on the button - a hand toggles between the different options, which change randomly from day to day, and you press the button to start a day's work when the hand is over that option. Sounds easy, but as the game progresses the hand moves faster, and some of the options, such as a visit to the evil bank manager, are detrimental to your progress. Fortunately, however, there is an option to slow down the hand by simply invoking, if you're quick on the button, a famous Stooges slapstick scene involving poking eyes and kicking knees. To raise money you can work at a restaurant serving pies, work a hospital, place Curly in a boxing ring, find stray cash on the street or again volunteer Curly to eat at an oyster eating competition. Control can be from either the keypad with open apple as the fire button or joystick. Given time, The Three Stooges is a game you can easily master. The better you get at it, the more fun it gets too: the pie fight in particular is great fun on harder levels. On the whole, another damn fine Cinemaware episode.